Living in the Bay Area has some perks. There are quite a few good places to eat. I haven’t explored too much, but I plan to! I enjoy eating my meals at home just because it’s cheaper and you can do anything you want while eating. Watch movies or TV shows. Read magazines or books. But it’s always nice to sit down with people you care about in a different environment… like this restaurant. Le Moose is a Thai and crepe place. I found out about this place because it’s right next to my favorite Korean fried chicken place. The restaurant has an open kitchen, meaning you can see them make the food. Even though my mind was set on ordering a crepe, I decided to go with Pineapple Fried Rice. I saw that on the menu, and knew that I just had to get that. 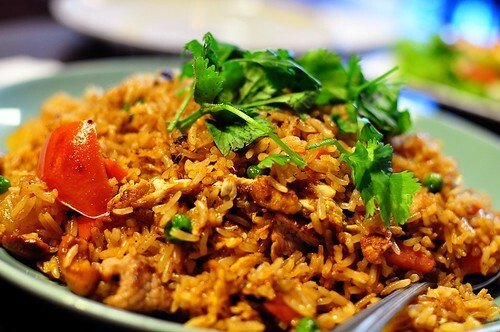 Who knew pineapples can taste great in fried rice?! But no worries, I also tried the Chicken Pesto crepe. It is their most popular crepe. I’m not sure how I feel about this crepe. I have had it twice so far, and there’s nothing too special about it. I feel like I can just make it at home and it would taste the same. But nonetheless, it was still very satisfying. 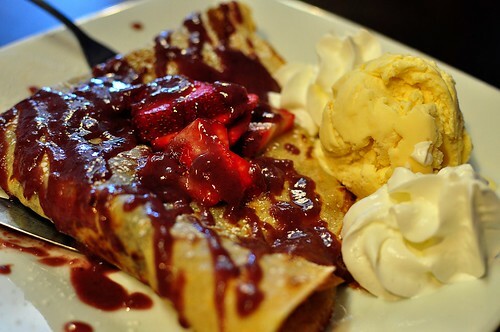 And for dessert, I chose the strawberry nutella crepe. I love how they did not skimp on the strawberries. They were warm, soft, and juicy, just a how strawberries should be. The nutella was a nice touch for the crepe with strawberries. I really enjoy this cafe because they have good quality food and they have really tasty desserts. Definitely a place to go back to try more things on the menu because they are likely all good! 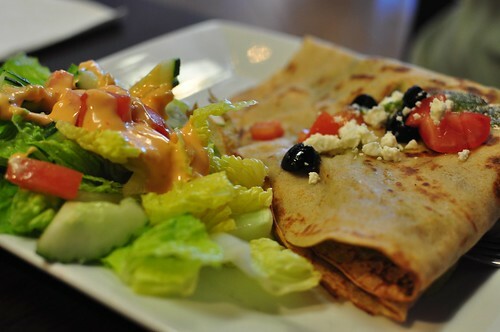 This entry was posted in Food Reviews and tagged cafe, crepes, food, nutella, reviews, strawberries, thai on September 19, 2011 by Krystal.